TATS A KOOL CHALLENGE: Just one more Heart! I wanted to make another heart to send to a friend......but I made a mistake!!!! I had gone too far to want to untat......so I winged it hoping that if I made the same mistake on the other half it might just possibly lie flat. Well it did and I think it looks lovely, it changes the shape of the heart. Can you spot the mistake...probably not, unless you are very familiar with this pattern. ...now can you see the mistake???? I had to look hard - the original has two split rings on each side at the bottom of the heart, your version has only one! But it's amazing how many things "looked" wrong when I was going crosseyed, trying to spot the mistake! Mistake or not, all the hearts are so pretty, beads and all! I always admire your colour selections, so striking! Hi Maureen,You are the first to spot it. It's amazing that I got away with the mistake! You can imagine my horror at tatting the missing ring on the other side and realising that it all looked out of shape. I feared that the whole thing would 'bowl' in the end. It's quite a difficult pattern with so many switches of shuttle and direction. Hi Singtatter, thanks for the lovely compliment. It's pretty. I'm not going to try to spot the mistake, but you can have fun with the people that do! I love the heart you sent me! :) It looks so much like this one. Oh boy.... This is the kind of thing I do - drives me nuts! But, I love the little heart; its edgy tilt gives it a certain panache! BTW, your post does show up on my blog, so I am not too sure why you did not see it?? Thanks Fox, your blog only showed me my old post, blogger has done that to me before and I have wondered why I didn't get any comments. Maybe it had arrived by the time you looked. Mistake? There are no mistakes in tatting! You know that. They are both lovely. Hi Tattycat, I almost agree with you! ALMOST! Everyone together, raise your right hand and repeat after me: It's not a mistake, it's a design variation. Yes miss! I did that! 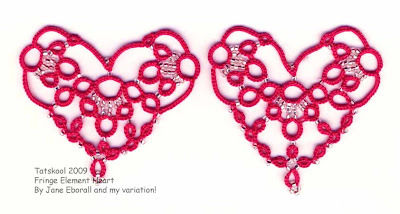 I love your hearts! I didn't realize how difficult the pattern was until I printed out and read it. A pattern for another time. I 'll content myself by looking at yours. The Pink Elephant and the Sat-Nav! Back to the wedding outfit...yet again! !